Dubai, UAE, March 22, 2018: Finding beautiful new OMEGA timepieces is a given at Baselworld, but this year, visitors to the OMEGA booth will also discover an easy and interactive way to revive the watch they already own. Nestled between two of OMEGA's eye-catching window displays is an altogether more hands-on experience. OMEGA's NATO strap 'Pop-Up Boutique' lets customers explore, select and buy NATO straps via a digital touch screen. No watches are for sale. The interactive concept store is 100% focused on the brand’s colourful and diverse selection of NATO straps. With bright, constantly-moving visuals, OMEGA's NATO Strap 'Pop-Up Boutique' shows how the look of an existing watch can be updated quickly and inexpensively with the addition of a new NATO strap, and entices wearers to give it a try. Describing the pop-up store as 'a leap into exciting new territory', President and CEO of OMEGA Mr. Raynald Aeschlimann, went on to explain the reasoning behind the brand's decision to go digital. 'We wanted to show our customers, in a visually compelling way, how the look of a watch can be utterly transformed by changing the strap. Many of our customers like to give their OMEGA a more personal touch and we support that, so it was important that we made the process of exploring, trying and buying the new NATO straps as simple as possible. It made sense to mirror the on-line experience'. NATO straps on offer include the new 'Country Flag' collection with 18 individual options, allowing customers to buy a strap inspired by their favourite places around the world. As well as the many popular styles of the 'Current Collection', such as NATO straps in brown leather and striped nylon fabric. One very unique part of this 'Pop-Up Boutique' experience, is the chance for visitors to have their NATO strap customised. Straps with leather keepers can be embossed with any name or wording requested (within limits), meaning that watch owners can purchase a one-of-a-kind strap with a very personal touch. This interactive concept has already been turning heads beyond Baselworld. The brand launched an exclusive 'Pop-Up Boutique' in the bustling and fashionable Marais district of Paris. The store has been open from March 1st at 11 Rue Debelleyme in the 3rd arrondissement. 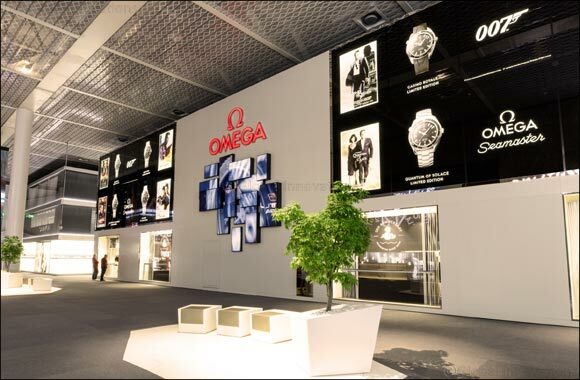 OMEGA's three-story, 1560-square-metre booth at Baselworld displays more than 200 pieces from OMEGA's watch families and Fine Jewellery collection, including of course, many of the brand's 2018 releases.